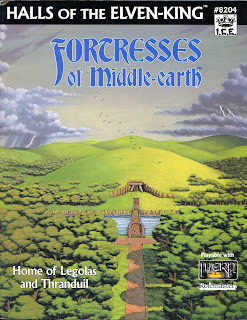 This fortress module atones for the astounding display of incompetence in Northern Mirkwood, and basically pretends that it's the first stab at Thranduil's halls. In a sense it is. The scribbled-up campaign version isn't remotely close to what could be thought of as the seat of Silvan royalty, and I'm not surprised ICE ditched it (along with the author's putrid prose) in a later '90s revision of Mirkwood. By comparison this product belongs in the Louvre. The only thing that grates on my nerves is the first-person narrative style used in the map key, told from the point of view of a Dale merchant who visited the elves. It's a nice try at something different, but memoirs are distractive to a DM who just needs the facts. Thranduil's abode is now grounded imperatively in the memory of Thingol: "Both housed great halls built under large hills on the banks of a river. Both halls had limited access over the river by a single stone bridge. The borders east and west were protected by rivers, and both were situated in a deep forest." While certainly no rival in size to Menegroth's thousand caves, these halls can still accommodate several thousand elves with a endless water supply from its underground springs, and the appropriate sense of a subterranean paradise is conveyed on every page. The front gate opens by command of song; Thranduil's throne room is subtly lit by torch and lamp, dominated by a throne of oak, the floor etched with floral images native to Mirkwood, its walls with tapestries of "birds and beasts frozen in flight and halted leap"; the feast halls are luxurious; the treasuries staggering. 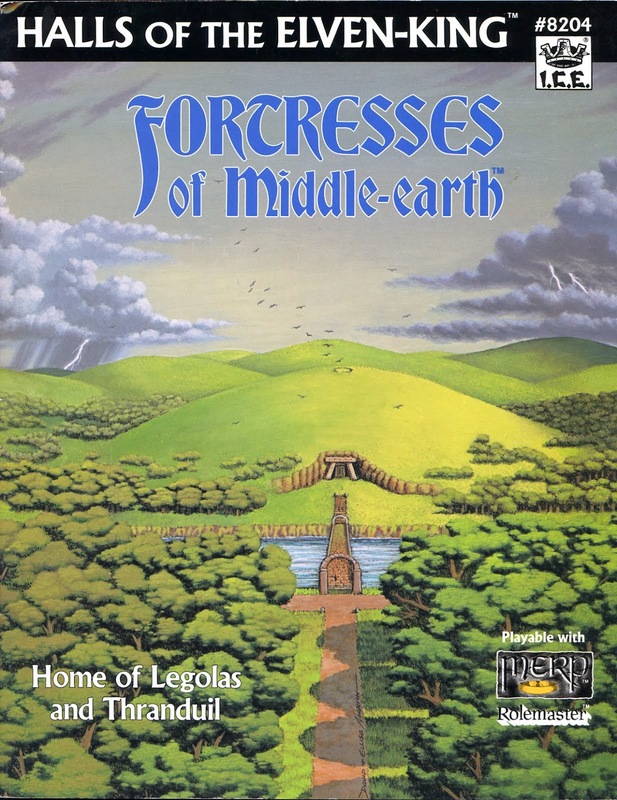 This is all prefaced by a brief history of the wood-elf realm prior to the construction of these halls in 1050-1100, particularly relating to Oropher's dispute with the Noldor, his abandonment of Lorien in the late Second Age, and the way his coming to Mirkwood blended Sindar and Silvan cultures. Because it's a fortress module (like Weathertop and The Teeth of Mordor), it benefits immensely from the mega-zoom shots of key rooms with detailed drawings. Every anvil, work bench, forge and barrel can be seen in the foundry, every tree pillar in the throne hall, every table and fire pit in the feast hall, and more. The two-page center displays an impressive 3D look at the halls through the outside hills, doing everything possible to bring to life ancient Sindarin architecture now fused with the primitive Silvan. 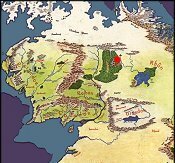 The halls are given four levels (against Northern Mirkwood's pitiful single one), a ground, an upper, and two below. There's an apothecary hall filled with potions that heal more powerfully than anything mannish or dwarven, derived from herbal lore and songs of healing dating back to the mists of time. The weaving hall contains garments of amazing design and function. And of course, there is the wine cellar with flavors unique to Mirkwood -- right above a hill stream that would provide escape for a certain hobbit and group of captive dwarves. Put simply, these are the Elven-King's Halls as they should have been done in the first place.